There are many people who are interrested about getting a Boston Terrier but how much do Boston Terriers cost? 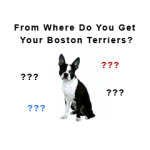 Boston Terrier prices vary according to your area and where you get him/her from. The average price of a Boston Terrier is from 200$ to 1,200$ or more. How much have you paid for your Boston Terrier(s)? Respond to the following poll. You can also leave your comments about the price of Boston Terriers and about the price you got your Boston Terrier(s). What is the price you paid for your Boston Terrier(s)?